Costly building work and unadaptable spaces can be avoided by considering cheaper and more versatile temporary room dividing solutions. The hospitality industry is highly susceptible to economic movement, both upwards and downwards. Venues are forced to widen their scope for clientele and are required to accommodate multiple functions at any one time. At busy times you may also need to open up that extra space, but allow a room configuration to accommodate bigger numbers. Maximum space versatility and adaptability therefore becomes critical to accommodate multiple requirements – often at short notice. We can help you make better use of existing spaces through intelligent space saving or space enhancing room dividers. We offer a range of solutions that are purpose built for pubs and clubs. They are designed to provide a temporary or semi-permanent room divides and offer maximum flexibility in terms of room configuration. 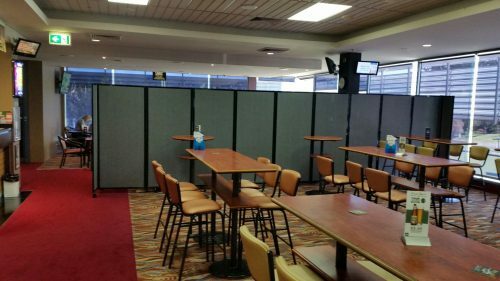 Sound absorbing materials are used on many of our partitions thus creating excellent noise barriers, providing temporary privacy solution as and when required. A private space, split space, meeting room or break out area can be created in a matter of seconds – for however long it’s required. Easy to move, fold and store when not in use. A specialist range of engineered acoustic polycarbonate partitions are also available. They are highly durable and are 100% waterproof and easy to clean. Ideal for the rigorous demands of the pub and club environment.